A number of months ago, I read a book that had a profound impacts both on me and on everyone I shared it with. A man named don Miguel Ruiz’s calls it The Four Agreements. Don Miguel is a nagual, or master, in the Toltec tradition. The Toltecs were a group of artists and scientists who formed a society to explore and conserve ancient spiritual knowledge. They came together at the ancient city of pyramids outside of Mexico City known as the place where "Man becomes God." Don Miguel Ruiz offers us principles from the Toltec tradition that resonate with essential New Thought principles, - or as many people are now saying - New Thought ANCIENT WISDOM because they are universal principles embraced in many traditions of many cultures and times. Understanding our thoughts and what runs us from within is the focus of Ruiz's book The Four Agreements. Ruiz offers a long and very interesting explanation about the beliefs in our life being formed not out of a process of choosing them, but through a process of agreeing with information given us by our parents, our tribe and our culture. Society's information is passed to us from the "dream of the planet" which contains various interpretations of life, like seeing life as if through smoke or fog. These interpretations do not allow us to see who we are, which is pure love and pure light. Instead these interpretations tell us that it is normal for humans to suffer, to live in fear, to create emotional dramas and so to dream hell into our own life. In the process of agreeing with the interpretations, we store the information; we believe it, and we surrender to the beliefs given us by our agreement with them. We live in a fog, or personal dream of life, which is what we believe of all the concepts, the human race consciousness has about what we are -- all the agreements, which have been made with others, with the self, and with God. really are, who you truly are, and cannot see that not free to be, but live trying to satisfy others' demands, living by other's points of view because of the fear of not being accepted, not being good enough for someone else. is possible, what is impossible, what is fantasy and what is reality. One single agreement is not a problem, but we have many agreements that make us suffer, such as agreeing to what is not enough, what is not deserving. Each agreement is a commitment of energy. It is up to us if we commit it to the truth of our being and to the thoughts that give power, or to what weakens and keeps us trapped in illusion. It is our job to break those agreements that are fear-based and drain off our energy and claims our personal power, and instead makes agreements that come from love. 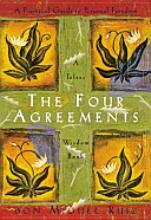 I’d like to highlight today my own personal beliefs -- using Don Miguel Ruiz’s book -- THE FOUR AGREEMENTS as my framework and I hereby re-commit myself to these agreements PUBLICALLY and invite anyone who hears or sees me breaking them to call me to them. I’d of course, like to invite YOU to make these same agreements. Are you game? Dr. Toni LaMotta has spoken internationally, authored several books and numerous articles and has served as a consultant, and trainer to a variety of corporations. Her experiences range from being a high school teacher to working with some of the top companies, associations, and organizations in the world. She served as a Catholic nun and pastoral associate for 16 years before discovering New Thought. She is currently the Minister of a Spiritual community in Sarasota, Florida. Her company, “InLightened Enterprises” provides messages that are provocative. Challenging your mind and inspiring your heart. They help to illumine false beliefs that may be barriers to spiritual growth and give insight to see your own truth. Get more from Dr. Toni at a class="authorinfo" href="http://www.freeinspirationalmessages.com" target="_blank" rel="nofollow">http://www.freeinspirationalmessages.com.